New England fall colors tend to bring on a black and white scenario. Leaf peepers seem to feel, though, that the most vibrant fall colors make for the best visual autumn experience. While the most brilliant colors never fail to amaze, it is often the mood of the given destination that serves as most memorable. 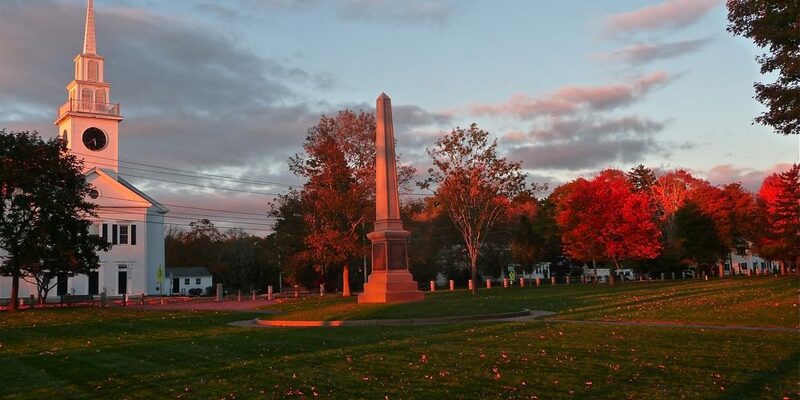 The town common is East Bridgewater, Mass., serves as a prime example of how the atmosphere of a place can feel just as vital as the autumn colors. Usually when driving past this town common, the crisp blue sky juxtaposes with the large parcel of green land, surrounding churches and old homes to create a classic New England scene. One day, however, at twilight, revealed a completely different personality with a scattering of colored leaves on the ground and maybe half ot the area trees having good color. With a muted sunset imminent and clouds producing a more stark, shadowy nature, the fall scene had little relation to what we expect autumn to be in our minds. No over saturation of colorful Kancamagus Highway or Green Mountains of Vermont leaves here! The takeaway: Fall in New England brings about many memorable landscapes without bright fall colors at the forefront. I didn’t think much of this scene, however, until months later when my wife, Joan — when seeing the photo — told me how special this scene must have been. I paused and reflected on this valuable perspective, then making it a future priority to see beyond the leaves during autumn in New England. Editor’s note: I wrote a chapter on the East Bridgewater Town Common in my book, Massachusetts Town Greens. I hope you have a chance to read the book! Enjoying a fall walk in downtown Peterborough, N.H.